In August 1943, the design department of Arado completed an extensive study into the future development of jet fighters. Designer Wilhelm van Nes put forward three fighter proposals: a twin-jet powered version, a rocket powered version and a combination jet/rocket powered version. 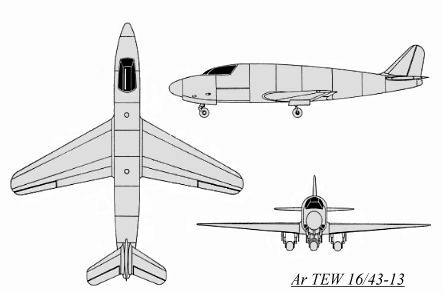 The Arado TEW 16/43-13 was a low wing, rocket powered interceptor. The wing and tailplanes were moderately swept back, and the Walter HWK 509A rocket engine was buried within the fuselage towards the rear of the fuselage. There were two fuel tanks (T-Stoff and C-Stoff rocket propellents) also located within the fuselage. 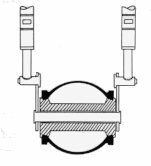 An interesting feature were the spherical tires, a space and weight saving innovation. Armament was to be two MG 151/20 20mm cannon and two MK 108 30mm cannon, all located in the nose.